You know what I love about chili? It’s ridiculously easy and just about impossible to screw up. It’s infinitely customizable to your tastes. There are about a million ways to make chili, and they’re all the right way. You can cook it on the stove or in a slow cooker, for 30 minutes or 3 hours. You can make it with or without beans, with or without meat. It can be insanely spicy or milder than a sunny Spring day. Really, there’s no wrong way to make chili. You know what else I love about chili? Chili. It’s pretty great right? You should make some. This is how I make mine. Because chili is so flexible, I never make it the same way twice. This is a base recipe that I adjust to my taste and whims. Adjust the amount of liquid (beer and broth) based on cooking time and consistency preference. I like thick chili, so to only cook it for about an hour I use 1/2 of both the beer and the broth. Use any beer you like in the chili. If you don’t like beer, don’t worry, you won’t taste it. You can replace the beer with beef broth if you prefer. This chili is just slightly spicy. Heat olive oil in a large deep pot* over medium heat. Add onion and saute until translucent and tender, about 5 minutes. Add ground beef and garlic to skillet, breaking the meat into crumbles. Cook until beef is browned and no longer pink. Add remaining ingredients, starting with 1/2 beer and broth amounts and adjusting seasoning to taste. Bring to a simmer and cook, stirring occasionally, for at least 30 minutes, up to several hours. Add remaining liquids if needed as the chili cooks. Serve hot topped with cheese and a dollop of plain Greek yogurt or sour cream. *Alternately, to make this recipe in a slow cooker, cook the onions, beef, and garlic in a large skillet on the stove. Add meat mixture to slow cooker and combine with remaining ingredients. Set slow cooker to LOW and cook for 4-8 hours, or until ready to serve. Chili and I are BFF at the moment. I’ve been craving it constantly and can’t really understand why. I mean, I do, because it’s awesome. It’s more like why NOW. Love the sound of this base recipe! I’m definitely going to need to give it a go! Yum! It sounds so delicious! Believe it or not chili was one of those simple meals that I just could not get right for the longest time. I have no idea why. Bachelors can make chili that tastes good and I couldn’t. :) I finally found a recipe that that I love but I think I may have to try this one as well because I’m loving that list of ingredients. Oh, the first time I ever made chili in college, I messed it up soooo bad. I must have put a couple tbsps. of salt into the pot ~ I’ve sinced blocked out the whole episode. Needless to say, it was not edible. Yours, however, sounds excellent! Love the add-in of cocoa powder. Oh, well yes, I supposed there is one way to ruin chili ;) But I’ve heard adding potato to overly salty foods helps, so maybe you could have had some potato chili! Ohhhh yes….one CAN screw up chili. My mother used to put RAISANS and CASHEWS in hers! You say what?! And you know what happens when you cook raisans in warm liquid, right? They turn into grapes. Horrible horrible. Don’t do it, for the love of God. But yours looks divine and my mother should follow your recipe to the T.
OK, I stand corrected! You CAN screw up chili. Raisins? Cashews? I would have never thought. 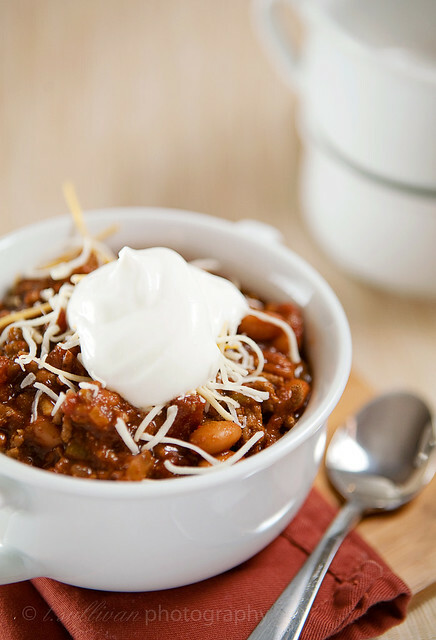 I’m definitely making this tomorrow… I’ve been looking for a good, semi-simple chili recipe and I just stumbled upon this one, so perfect timing! Beer, green chilies, and cocoa powder? Sold! and chives or diced onion—-did use the cocoa and only 1 lb. of beef—this was a huge hit!!!! Looks perfectly yummy. I’ve been looking for a slow-cooker recipe for chicken chili…may have to put that on hold to try your version! You know, I would have thought that we were past the time of year for chili, but then I looked outside…and it’s snowing. Chili for dinner tonight! I enjoy chili with sour cream and LOTS of cheese!! YUM! this looks good :) I might try and this and use ground lean turkey instead of the beef! looks so delish!!! cant wait to make it my self!!! congrats on being fp’ed! the picture is so mouth watering! yeah, my mum puts baked beans in. not cool. yours looks lovely!! I’ve never tried chili before, but judging from your post it sounds pretty delicious. I am sure I will try your recipe once I find the time! I love cooking chili for all the same reasons. Great photo. Will definitely try this recipe! I love love love chili too! I was surprised with some of the ingredients you use. Cocoa was the biggest surprise. Sounds like a winner. I LOVE chili, and this recipe looks delicious. Thanks for sharing, and Congrats on being Freshly Pressed! I LOVE chili with sour cream involved. Nice! This looks great! I can’t wait to try it! Who doesn’t love chili?! Just went to a chili cook-off yesterday. Wish I would have found this recipe to try! It sounds perfect! Looks really good! Must try. Beer in your chili!?!? I would love to try your recipe! You are right- it is the ultimate comfort food, and best enjoyed with beer as well. Love the name of your blog… that is me all the way… nice to se ethat I am not the only one who is passionate about/whose life revolves around food… fab blog! MMMMMM! Chili! Your mix sounds very good, though I have found that keeping it simple is the best way… cooking for a long time! The minute I saw sour cream, I thought OMG yum. I love the stuff. The cocoa powder seems a bit strange, but I’m sure it will end up tasty a la a Mexican mole. Interesting recipe. Thanks for sharing! this recipe looks awesome. I must give it a try and soon! I love making chili all different ways. last time I made it, I used cumin, cayenne, and garam masala for an indian inspired flavor. it was SO good. Good recipe! I recommend cutting up some spicy Italian sausage and cooking it with the beef…I like how alittlebarefoot’s Indian inspired chili sounds. YES! Chili the perfect meal! Okay some may “know” how to screw it up ( they are either trying too hard or not thinking). I hardly ever follow a recipe so mine comes out different every time. My daughter made me write it down once. I will probably never look at it again! :) I heard about beer in chili. Never tried it. Hum, I feel a chili night coming on! Thanks, and congrats on being FP! Would you happen to have a good recipe for vegetarian chili? I’ve always thought booze and chili was a great combination! I have yet to try substituting beer for the broth. I like pretty much anything from a Corona, a hoppy IPA, to a smooth stout like Guinness. Which beer would you recommend? I’m gonna have to try this one. I love chili, especially when it is “chilly” out. And, I have never made it with the addition of cocoa powder, but I love everything chocolate, so I’m gonna try it. Thanks for posting. A tablespoon or 2 of your favorite creamy peanut butter is a nice addition as well. Thanks for the tips! Can’t wait to try the beer and cocoa powder – YUM! do you know what is the norouz or 7 sin ? Looks good. I’ll try yours if you try mine. Yu-hum! Thanks for the great inspiration. And congrats on the FP! I love food blogs. Such great recipes and photography! That looks very appetizing and like something I will have to try very soon. Thanks for sharing. The picture looks absolutely delicious. Yummy! I love chili – this looks delicious. I think my dad is going to LOVE this recipe – can’t wait to give it a go! Will definitely ramp up the chilli for him! Love this receipe.. We probably have every ingredient listed. Thank you for posting.. Sounds Delish. That’s really scrumptiously delicious! Very well detailed too. Wow, I love that too. I don’t get it. Dark Cocoa powder in chili? Even though it’s optional, sounds tasty to me! YUM! this looks delicious. If you’re really into chill, try Milwakuee styled chili. I’m a Californian girl and I tried it in within the last year…. I will never go back to any other style of chili! give it a try.